High quality 15m plug to socket TV aerial cable. High quality OFC coaxial cable. Male plug to female socket cable. 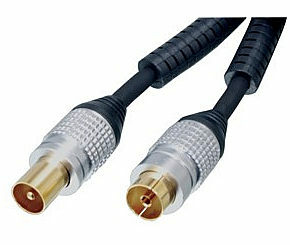 Male to female aerial cables are used to connect from equipment to the TV or from equipment to equipment, eg from a Freeview box to the TV or Freeview Box to DVD recorder. SLX Gold 2 way TV aerial amplifier booster by Philex 28102R Flat gain response across full frequency spectrum ensures optimum digital reception. Fully compatible with Sky/Sky+ digieye/digilink remote control extender systems. Can be used to boost the signal from VCRs, DVDs and satellite receivers. DAB/FM tuner can be connected to any of the amplifier outputs. Features built in Tetra Filters, Surge Protection and Short Circuit Protection. Full VHF compatibility for TV and FM/DAB including Ireland. 8dB gain per port. Noise figure <4dB. Frequency Range VHF/FM/DAB47-230MHz UHF 470-862MHz. 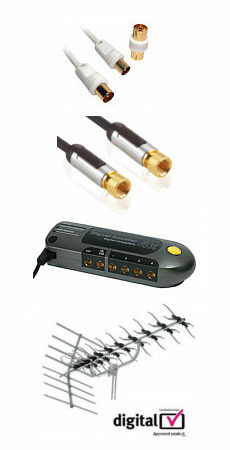 Designed to distribute Digital TV and Digital Radio signals to up to 2 TVs/DAB tuners.